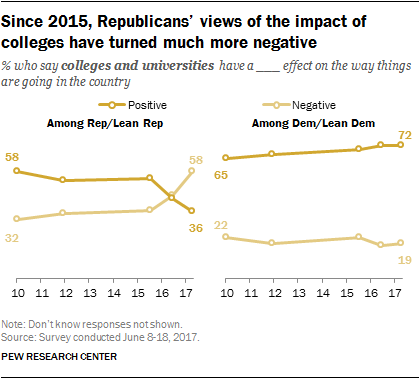 I'm actually surprised that it's takien this long for GOP voters' opinions to turn against higher learning, given how popular professor-bashing has always been on the right. By 46% to 37%, more Republicans say banks and financial institutions are having a positive than negative effect on the country. Positive Republican views are up seven points since 2016; this is the first time in surveys dating to 2010 that Republican views of the impact of financial institutions have been more positive than negative. Banks gets a thumbs-up from a plurality of Republican voters,, but labor unions continue to get a thumbs-down, although the gap between positive and negative opinions has narrowed. That gap is still in the double digits, however -- 46% of Republicans don't like unions, while only 33% do. By contrast, 59% of Democrats have a positive opinion of unions. But Bryce is going to talk about haves vs. have-nots, and Republican voters prefer the haves. Republicans do hate rich people if they're from Hollywood, but generally speaking, the GOP electorate thinks a typical college professor is more of an elitist than a financial-industry muckamuck who makes a thousand times as much money per year. So, sure, run anyone who can fire up the Democratic base and maybe win a few voters from the middle -- but don't assume you're going to win the angry white male vote just because your candidate has a beer gut and dirt under his nails. If your candidate talks about economic injustice, Republican voters will think he sounds just like a dirty liberal.